You just have to visit them, click on store you want to shop, and check if any coupon code is available for you. click on the deal and get the coupon code and use it when you are checking out during your shopping. i am sure many of my readers and blog followers dos hop from web, so thought to share this new thing with you all..hope somehow it will help you someday. Last month, during Christmas time I baked lots of cakes and cupcakes for family and friends, these are one of them. 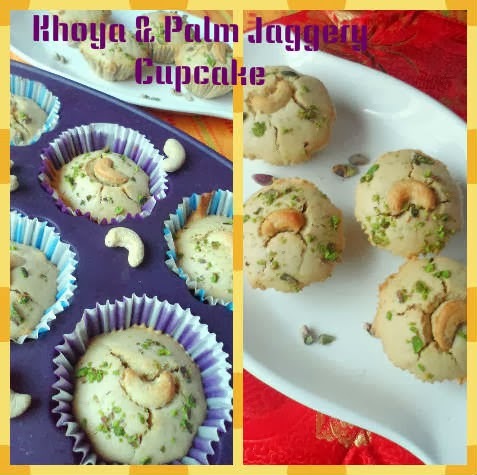 Khoya cupcake is a thing, I was totally unaware of its existence until my blogger friend, Amrita Gill of "Sweet 'N' Savoury" posted this on her blog. She is an excellent baker who incorporates unusual ingredients and makes superb flavourful baked goodies. I am totally inspired by her baking experiments. 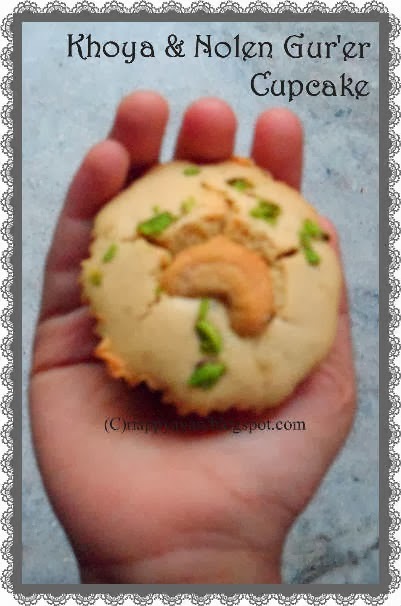 Another such experiment she did is Nolen Gurer Cupcakes(cupcakes with palm jaggery), which I also wanted to try. If you don't know what is Palm jaggery, then it is jaggery made from palm tree and only available during Winter season. 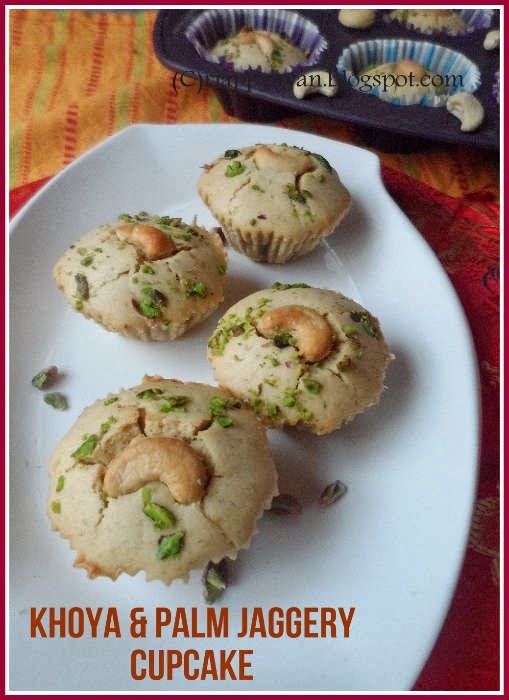 My hungry soul eager to try her recipes, combined two of her recipes and made these Khoya & Nolen gur'er cupcake, flavoured with pistachios. I was very sure that two of them will marry each other in one recipe and I was right. The cupcakes were so flavourful, soft and delicious, just melt in mouth. Check the links above for her recipes. Preheat oven to 180 degree C. Line cupcake moulds with liners or grease them well with butter. In a medium bowl, beat butter, egg and khoya/mawa till soft and fluffy. Add sugar and jaggery and beat again until you have a smooth batter. Add rose essence in the wet ingredients and stir to mix in the batter. In another bowl, sift the dry ingredients, flour, baking powder and grounded pistachios. Add this mixture gradually in butter-mawa mixture. Add milk slowly as needed while beating with an electric beater till you get a smooth creamy batter. Pour prepared batter in the cupcake moulds until half full. 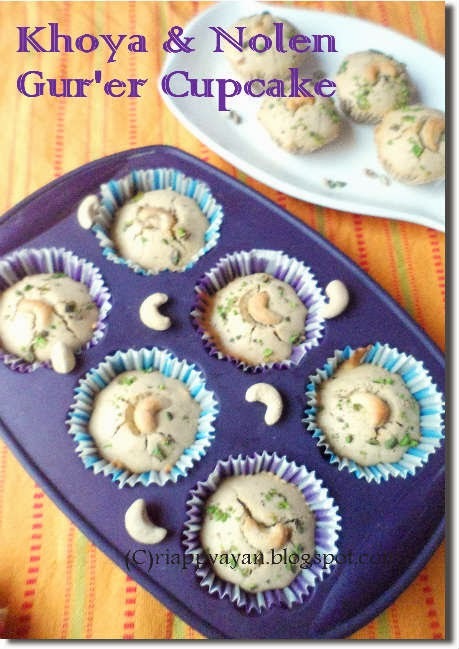 garnish with a half cashew nut and sprinkle some chopped pistachios. Put in the oven and bake for 35-40 minutes or until a toothpick inserted comes out clean. Cool on wire-rack and serve.